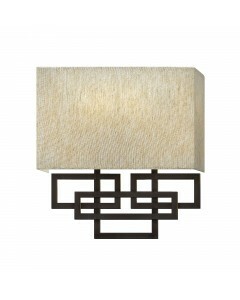 This Lanza 3 light large pendant makes a chic statement with its strong, rectangular metal work. 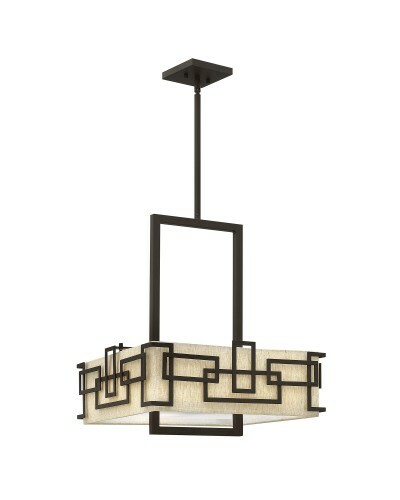 This contemporary style pendant features geometric detailing, a casual untrimmed oatmeal linen shade and an acrylic lens for sophisticated, modern appeal. 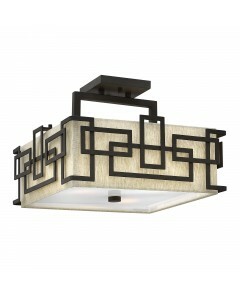 The Oil Rubbed Bronze finish complements the shade beautifully bringing pure elegance to its design. This large pendant has a height of 540mm and a width of 457mm. It is also supplied with 1 x 100mm, 1 x 150mm and 2 x 300mm rods, which can be used in any combination, making it ideal for many ceiling heights.